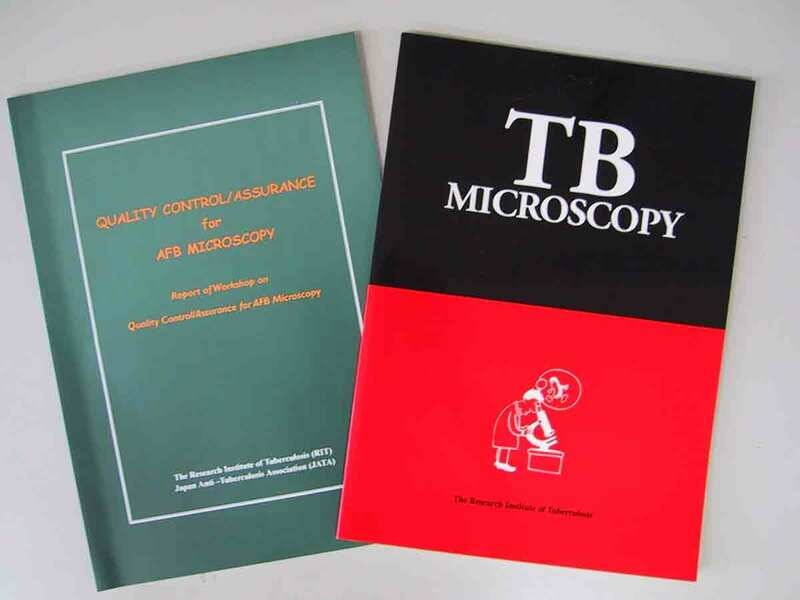 RIT / JICA Publications on TB Laboratory Works,both written by Ms Fujiki, A. "TB Microscopy" was translated into Arabic and Russian.All these materials could be best utilized under a proper 2C system. Quality Control in TB Laboratory Works is a good example of things that are talked about too much and practiced too little. Nobody doubts the significance of it in the current tuberculosis control in terms of quality of diagnosis and treatment monitoring. Moreover, its significance has been recognized in most NTPs so that it is an integral part of the program there. However, it is either not functioning at all or functioning very poorly. Unfortunately, this is true even in the NTPs famous for high achievement in DOTS. Also, it is typical that every reported case always achieves very high results. In other words, when it is actually practiced properly, it is not difficult to achieve high performance. What, then, accounts for the difference among implementing organizations? The difference results from different degrees of motivation of the staff. Then, how can we assure the staff's motivation? All these remind me of the "motivation trials" that were practiced in 1960s and 70s in many places, i.e., the operational study to enhance the motivation of the staff and patients in order to achieve high proportion of treatment completion. These trials were almost always successful because they were conducted with enthusiasm by highly motivated staff. However, such trial-proven systems were very rarely effectively applied on a nationwide scale. Instead, much later in the 90s, such motivation-oriented patient management was transformed or sublimated into the concept of "DOTS." If the DOTS concept is effective in assuring motivation of both staff and patients in treatment services, why is it not so in the motivation for laboratory QC? Indeed, there should be a hard technology or strong and practical guidelines with which the QC of laboratory service must be practiced in NTPs. Then, what is the lab version of the Global Target? What about "Achieve QC results with less than 2% of false positives and less than 5% of false negatives"? Finally, we should remember that for NTP's DOTS to be the DOTS, it has to have a component of "quality smear microscopy for diagnosing patients," which should be possible only with a well-implemented lab QC as a nested DOTS. Recently I was given an opportunity to study epidemiology in London School of Hygiene and Tropical Medicine. It was a really exciting experience, mainly for three reasons. First, I was able to update my knowledge of and skill in communicable epidemiology. The course covered both communicable and non-communicable diseases. It made me understand principles of communicable disease epidemiology applicable to tuberculosis as well as the uniqueness of tuberculosis more clearly and profoundly than I previously had. Secondly, I think that I have also learnt some new ideas on how to organize a training course. Lastly, studying together with classmates from different fields was really exciting. 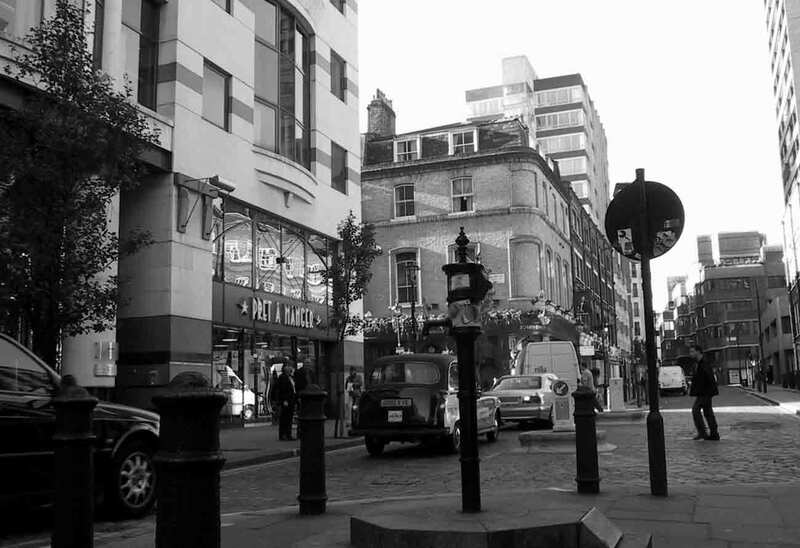 They often gave me new viewpoints and made me re-visit what seemed to me to be items of common sense. Using what I learned from the study, I hope to improve my fieldwork and to make a contribution to the further development of our international training course. For almost three months we have enjoyed Japan -- its nature, customs, weather, meals, and the sensibility and kindness of its people. We have enjoyed different smells and different tastes at the dormitory. We will recall with fondness crowded laundry on weekends, our classroom, and our colleague next to us sheering impressions, comments, and smiles. We have all enjoyed our study tours to interesting and beautiful places like Niigata, Nagasaki, Osaka, Kyoto, Mt. Fuji, the ice cave and many other places of Japan. School visits and fun with children will also be a lifetime memory for us. In our training course, we have enjoyed excellent lectures, interesting workshops, and the visit of "The Minister of Health" (Mr. Andy Beggs)! He acted so thankful to our advisers that he sent a present to each one of us: a sweet tangerine! Japan was our home away from home for almost three months; bringing with us new friendships, great and unforgettable experiences, maturity and overall knowledge. Our time is now at hands; in our hands is the possibility to change the global TB situation through our best efforts. It depends on each one of us, working together. We need to create, to innovate, to share our knowledge, to use our experiences and to propose real solutions in each one of our different realities. The opportunity is in our province, district, and country. We need to work together over the distance, and to carry out our mission as health personnel, for the benefit of humankind. After six weeks of a training course jointly organized by RIT and JFAP, I am very pleased to state that this course has been both valuable and fruitful. What impressed me most during this course was the lecture entitled "What to do and How to do it" - in response to the HIV/AIDS epidemic in our own countries. This course helped us to experience how HIV/AIDS management could be applied, linking HIV/TB services so that we are able to select, adapt and transfer practical elements to our own programs. Not only have we learned about HIV/AIDS management, but we have also learned new concepts through training methodology. The training technique which was used in the course was very efficient and created real participation among the participants. It would be easy to apply this technique to our own programs. This training was geared to the needs of training participants who wish to improve their management skills in community-based prevention, control and care for people living with HIV/AIDS. The course focused on learning through experience and participatory observation through extensive field exposure in Japan. As a result, the participants were able to identify strategies and approaches through their experience in the course that were applicable to their own countries. Based on these insights, especially the project cycle management (PCM) method and our personal experiences, we were able to produce successful action plans. I am confident that these will prove very useful in our own countries. The Stop TB Initiative was launched in November 1998 by the Director-General of the World Health Organization, as a global partnership of organizations working together to stop the global TB epidemic. The Partnership, which currently consists of more than 100 partners, involves all those organizations and individuals committed to short and long-term measures required to control and eventually eliminate TB as a public health problem in the world. The Global Partnership to Stop TB aims to accelerate social and political action to stop the unnecessary spread of TB around the world. Stop TB is evolving rapidly to engage new, diverse partners, in the public and private sectors. Building expanded support for good TB control and strengthened health systems in high prevalence/low income countries is the central focus of the Partnership. 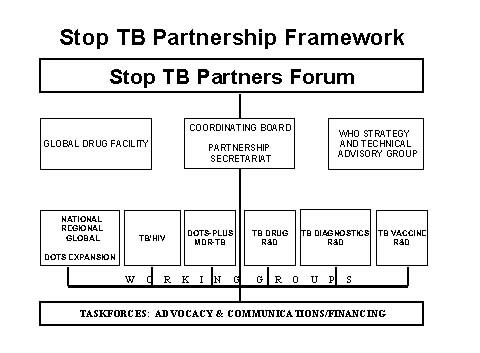 The supporting structure of the Global Partnership to Stop TB comprises a Stop TB Global Partners' Forum, a Stop TB Coordinating Board, Working Groups, the Stop TB Partnership Secretariat, WHO Technical Advisory Group and a Global TB Drug Facility. The Forum consists of an assembly of stakeholders in the Global Partnership. In its overall purpose is to promote and enable the acceleration of action to stop TB, through networking and exchange of relevant information with all involved. The Board represents and acts on behalf of the Global Partnership. In its composition, the Board reflects the major groupings and the diversity of the partnership-science, policy-makers, financial donors, field/country level programme managers, the private sector, civil society and those concerned with advocacy and communications. The purpose of the Stop TB Secretariat is to support the Stop TB Partners in fulfillment of the vision and mission of the partnership. The Secretariat aims at facilitating, creating synergies and adding value to the work of others in the Global Partnership. Six working groups provide a focus for coordinated action, with one focusing on DOTS expansion, two addressing new threats of HIV-related TB and multi-drug resistant TB (MDR-TB), and three working on development of new tools - drugs, diagnostics and vaccines. Each of the Working Groups has independent governance mechanisms, but all are working under the umbrella of the Global Partnership to Stop TB (see fig. 1). WHO initiated in mid-2000 a rapid assessment of the progress of DOTS expansion in the 22 high-burden countries. This evaluation revealed slow progress in the expansion of the DOTS strategy. This situation prompted WHO to develop a strategic and coordinated plan, the Global DOTS Expansion Plan (GDEP) to facilitate the development of individual countries' national DOTS expansion plans. In order to further the objectives of the GDEP, a Working Group on DOTS Expansion was established to increase resources for TB control by involving new partners, fostering and maintaining political commitment for health issues affecting the poor, and stimulating societal demand for effective TB programmes. 36 million people were living with HIV/AIDS at the end of 2000. TB is a leading killer worldwide of persons living with HIV/AIDS (PLWHA). HIV fuels the TB epidemic by promoting rapid progression of primary TB infection to active disease, and is the most powerful known risk factor for reactivation of latent TB infection to active disease. The goal of the Working Group is to reduce the burden of TB in high HIV prevalence populations (TB/HIV). Members of the Working Group include managers of national TB and HIV/AIDS programmes and representatives of NGOs, academic institutions, international development assistance agencies and groups of PLWHA. 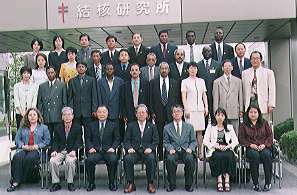 The first meeting of the Global TB/HIV Working Group took place in Geneva, 9-11 April 2001 and represented an important step in harnessing and coordinating global efforts to provide a more effective response to TB/HIV. In response to the current global TB problem and the shortcomings of the existing BCG vaccine, the WHO/UNAIDS Initiative for Vaccine Research (IVR) has established a Global TB Vaccine Initiative. Building on previous WHO efforts in defining a global research strategy for TB vaccine R&D and fostering partnerships among the different players in the public and private sectors, IVR is active in coordinating vaccine development efforts among academia, industry, and regulators on the one hand, and the public health community as representatives of the end-user communities on the other. The TB Diagnostic Initiative (TBDI) was established by WHO/TDR, in recognition of the urgent need for new diagnostic tools to support TB control activities in case-finding and in detection of drug resistance and latent infection in high-risk individuals. The goals of TBDI are to exploit recent remarkable technical advances to develop new diagnostic tools, to provide objective data on the performance of new tools as they are developed, and to assist control programmes in the appropriate deployment of novel approaches. To accomplish this, TBDI partners with industry, academic researchers, and national and local health officials. The Global Alliance for TB Drug R&D is a not-for-profit venture that will accelerate the discovery and development of new drugs to fight TB. It is one of a new breed of public-private partnerships (PPPs) that pursues a social mission by employing the best practices of the private sector and by drawing upon resources from both the public and private realms. Although scientific advancements hold out great promise for TB drug development, the private sector views the TB market as relatively unattractive. The mission of the Working Group is to accelerate the discovery and/or development of cost-effective new TB drugs that will shorten the duration of TB treatment or otherwise simplify its completion, improve the treatment of latent TB infection, or be effective against MDR-TB. The Global TB Drug Facility (GDF) is a mechanism to expand access to, and availability of, high-quality TB drugs to facilitate DOTS expansion. The GDF will enable governments and nongovernmental organizations (NGOs) to implement effective TB control programmes based on the DOTS strategy. By securing the timely supply of quality TB drugs, the GDF will complement other activities designed to increase access to quality drugs within effective TB control programmes. With an initial contribution from the Canadian Government, operations have started and 12 countries will receive support from the GDF following two rounds of applications. It is expected that GDF will benefit around 300,000 patients during its first year of operation. The Thai Ministry of Public health (MOPH) and the Research Institute of Tuberculosis (RIT), Japan, have workd in collaboration since1963, when two MOPH staff members joined the first international training course at RIT. Over 100 Thais have been trained at RIT. 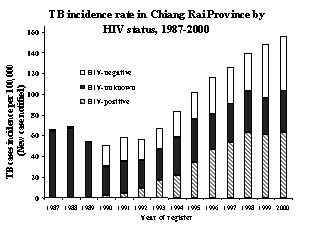 In 1995, a TB/HIV Research Project was established in Chiang Rai based on this long-term relationship. The Ministry of Public Health (TB Division), Chiang Rai Provincial Health Office, Chiang Rai Regional Hospital (CRH), all community hospitals in Chiang Rai province, the HIV/AIDS Collaboration (HAC) under US-CDC, and RIT are participating in this collaboration. Chiang Rai is a province in northern Thailand where HIV epidemic was intense in the early 1990s. Despite a recent decline in HIV incidence, the HIV epidemic has long-term impacts for the increase of TB cases in this province. New TB incidence rates per 100,000 population were 63 in 1987 and 50 in 1990, but increased to 156 in 2000. Drug resistance was also high with MDR rate of 6.3% in 1996-1997. Surveillance on TB and HIV in the province was initiated in early 1996. All AFB-positive pulmonary TB cases in Chiang Rai have been identified, interviewed and sent for culture and drug susceptibility testing. The project has also maintained a computerized TB registry system since 1987 and a mortality database since 1995 under the Chiang Rai Provincial Health Office. This database has been integrated into the routine TB information system of the province. It is expected that the rate of drug resistance will decline after the strengthening of TB control measures through DOTS implementation. TB research has expanded to study molecular epidemiology based on DNA fingerprinting and other genetic information of TB isolates (in collaboration with Mahidol University and BIOTEC) and also to find ways to prevent transmission to household contacts and the community. We are also investigating the role of integrating counseling and screening on TB and HIV among household contacts. CRH and HAC conducted a cross-sectional study in 1995-1996, which detected increased risk of TB infection related to health care worker's occupational exposure at CRH. CRH and HAC invited RIT and the project to set up the follow-up research in 1997 to reduce the risk of nosocomial TB transmission. TB/HIV Research Project has worked with Mae Chan Hospital for TB prevention among a group of people living with HIV who were registered in the daycare center (DCC). Based on this experience, the project is working with the partners to set up DCC-based cohorts for the whole province. Inspired by RIT's vice director, a social scientist (also a Ph.D. research fellow) conducted her research to include major concepts in medical sociology and anthropology in TB/HIV care and prevention. The research findings have been translated into actions for TB and HIV/AIDS control activities. Two printed materials were developed and have been used for health staff training and for community and patient health education. 1.A manual entitled, "How can an effective home visit convince TB patients?" http://www.stoptb.org/Working_Groups/TBHIV/Index.html of WHO www site. 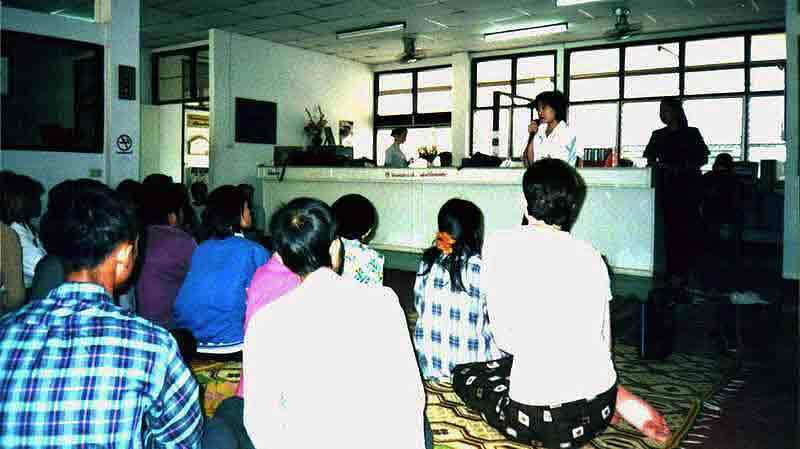 With the initiation of Dr. Pathom Sawanpanyalert and Mae Chan Hospital, a cohort study of drug users based on the Methadone program was set up in 1998. We are studying drug use patterns, sexual behaviors, HIV, HCV, and TB related to morbidity and mortality, as well as their risk factors. Since 1989, Dr. Pathom has also been working with the project to maintain the donor registry database system in order to improve blood safety, particularly by reducing the HIV window-period risk. *	Supervising graduated students as "TB/HIV Research Fellows" to conduct field research. *	Organizing regular provincial TB meetings. *	Serving as trainers for TB and HIV/AIDS training in Thailand and international training in Japan. *	Serving as referees for the TB international journal. *	Serving as short-term consultant for domestic and international agencies as well as serving as member of the Scientific Panel for WHO Working Group on TB/HIV. On line NEWSLETTER FROM KIYOSE is available.